The Paint Committee of the M-M Collectors Club has developed a chart with a complete list of paint combinations used on M-M tractors and implements. As we all know, M-M was a small company and did some very unusual things in small numbers. Therefore, we will always have some exceptions to the way tractors were painted from one day to the next. We have tried to develop the most accurate reference possible with input from many knowledgeable people. The following links go to PDF files you should be able to print. If you disagree with the information provided please contact the Web Manager and your input will be reviewed with the Paint Committee. The paint committee is also working with paint manufactures to provide accurate colors and up-to-date codes for each color. We expect to have this information later this year. 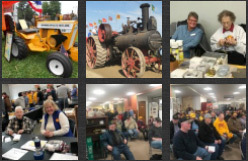 MMCI is pleased to provide, online for the first time, the following lists of tractor technical manuals and MM Service Bulletins available from the Floyd County Museum at Charles City, Iowa. Each link above goes to a PDF file you should be able to print. You need Adobe Reader to open the PDF file. This software is free and available at Adobe Reader.